If you are moving to Atlanta, do give us an opportunity to help you. We will introduce you to the best long distance movers in the business and you could choose to let one of them move all you precious belongings to Atlanta. Before you make a firm decision on international relocation or long distance moving, it is best to have a little information about the place you are moving to. The capital city of Georgia, Atlanta, is located in the northern part of the state. It is located on the Piedmont Plateau, on the eastern slops of the Appalachian Mountains. Though the city is rather small, the metropolitan region is one of the largest in southeastern United States. In 2003, the estimated population of Atlanta was 423,019 individuals. The density of population was 3161 people per square mile. The density of population is rather low when compared to other cities of the country. The population comprises of people who are blacks, whites, Asians, Native Americans, Native Hawaiians, Pacific Islanders and Hispanics. Once you shift into the city, finding people of interest and people who are from the same country is not difficult in cosmopolitan Atlanta. 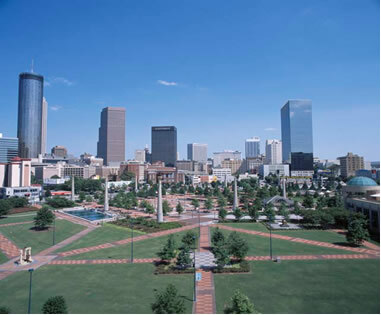 The business capital of the South east, Atlanta has seen a rapid economic growth in recent years. The headquarters of most of the big companies in the country like Coca-Cola, United Parcel Service, Georgia-Pacific Corporation, Turner Broadcasting system and Delta Air Lines Inc., are located here. Most other large business houses have branch offices in this city. Finding a job in Atlanta is not difficult. However, before moving into the city it may be wise to have a contract with one of these companies so that living in Atlanta is not difficult. Apart from the above mentioned sectors that affect the economy, the other important agencies of Atlanta are government agencies and activities, transport facilities, industries and convention trade. The Center for Disease Control and Prevention employs a large number of Atlanta area residents. The hospitality and convention industries also contribute to Atlanta’s economy, with three large trade facilities within the downtown area: the World Congress Center, the Merchandise Mart, and the Apparel Mart. The two largest newspapers in the city are the Atlanta Constitution and the Atlanta Journal. Once you move to Atlanta, you will find that traveling in and out of the city is not difficult at all. Atlanta’s Hartsfield-Jackson International Airport is one of the largest and busiest air terminals in the United States. Apart from establishing the city as a leader in air transport and commerce, it helps people commute in and out of Atlanta with ease. The city is also served by three interstate highways, as well as freight and passenger railroads. A quick glace at the landscape will enable you to be sure of where you want to stay and what you can do in various parts of the city you are moving into. Often described as a Horizontal city, Atlanta has grown with no natural barriers restricting it. The tallest and closely grouped buildings are found in downtown Atlanta around an intersection called Five Points. This is the historic and business centre of the city. 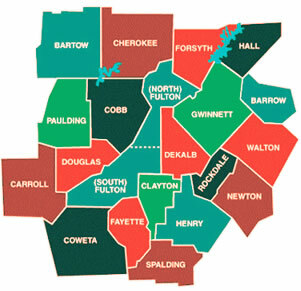 North of this area are Midtown and Buckhead, the location of many of the city’s cultural institutions, Piedmont Park, and a number of older, traditionally white residential communities. East of downtown is the Auburn Avenue community, the historic center of the city’s black business, religious, and entertainment life. In this region is the Inman Park, and Georgia’s Stone Mountain Park, featuring the largest granite outcropping in the world and a massive relief carving of Confederate leaders from the American Civil War; the park also contains historic houses, a museum, recreational facilities, and a campground. There are many interesting places to see in Atlanta, whether you are a visitor or whether you are moving to Atlanta. In downtown Atlanta, there is the State Capitol; Underground Atlanta, a n marketplace with shops, cafes and small bars; the City Hall; and the Peachtree Center business complex. The Georgia Dome is home to the Atlanta Falcons football team. The Philips Arena is where the Atlanta Thrashers hockey team and the Atlanta Hawks basketball team began playing in the year 1999. In South Atlanta is located the Atlanta Zoo; the Cyclorama, a mural portraying the Civil War Battle of Atlanta; the Wren’s Nest; and Turner Field (home to Atlanta Braves baseball team) which was started in the year 1997. The site of Ansley Park residential community and the Atlanta Botanical Gardens, are located in Northern Atlanta. In Eastern Atlanta are the Martin Luther King, Jr., National Historic Site; and the Herndon Home which is the home of Atlanta’s first black millionaire, who was earlier a slave calledd Alonzo Franklin Herndon. The Six Flags Over Georgia amusement park can be seen on a drive to the western part of Atlanta. Higher studies or a teaching job in Atlanta is not very difficult to get. Before moving to Atlanta, y you must make sure to have applied for admission in any of these colleges mentioned below. The educational institutions in Atlanta are the Emory University; Agnes Scott College; the Cecil B. Day Campus of Mercer University and Oglethorpe University. The Atlanta University Center, the largest consortium of black colleges and universities in all of USA, comprises of Spelman College, Morris Brown College, Morehouse College, Clark Atlanta University, the Interdenominational Theological Center, and the Morehouse School of Medicine. The Georgia Institute of Technology and Georgia State University are also located in Atlanta. It is important to have a look at the taxation structure of Atlanta too before making a decision to move to Atlanta. Georgia, like any other southern state has many “hidden” taxes. The only consolation being that in other states one is robbed openly when it comes to paying taxes. In spite of this taxes are much lower in Georgia when compared to other states. In Atlanta, every county has its own taxation system. Fulton is the highest taxed county in the state in regard to property taxes, county ad valorem (car tax), and sales tax. In Gwinnett one will find property taxes and ad valorem lower than it’s neighboring counties of DeKalb, Fulton, and Barrow. The storm water tax has been recently enacted on property and this is expected to triple over the next 3 years. Cobb county is supposed to have the lowest sales tax and similar to Gwinnett county in overall ad valorem. Atlanta’s rural counties, have much lower taxes, but lack decent infrastructure. Living in style in Atlanta is very easy given that the taxes are much less and savings are more. One can live a very high standard of life when compared with others earning the same amount in other states. It is easy to give in to yours dreams and wishes and to make holidays and desires come alive. It may hence be a wise decision to relocate to Atlanta. So, with this knowledge at the back of your mind, if you want to move to Atlanta, do fill in all your details at our form online and we will be more than willing to help you shift by bringing the most reliable long distance movers at your service. We will ensure that you get personalized quotes from them totally free to help you make the right choice of moving company for your move to Atlanta.